F-3 precipitated rain and snow over the Northern States of India and Pakistan. Overnight, Amritsar got 20 mms, Srinagar 16 mms and Gujranwala measured 20 mms and Lahore got 16 mms. Next 3 days 18th/19th/20th, rains and snow will continue over the States of Kashmir (Srinagar 10 mms), HP and in many parts of Punjab (Amritsar 5-7 mms). and Haryana. 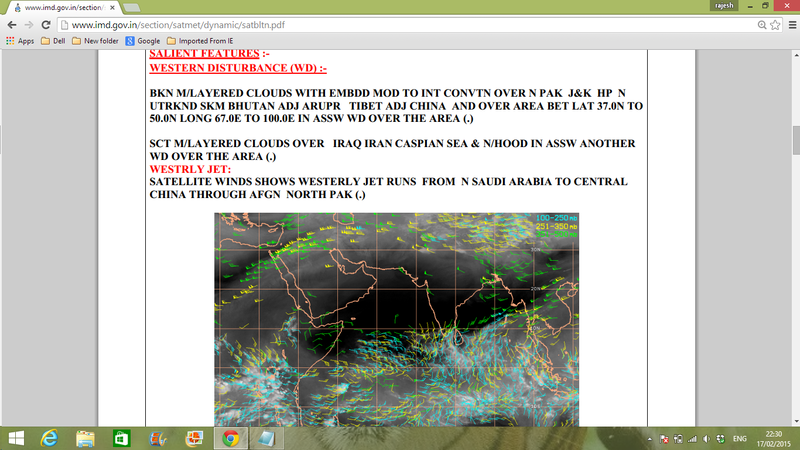 Pakistan Punjab also to get showers ( Islamabad upto 5 mms, Gujrat around 5-7 mms) . We can expect some light rains in Delhi on 20th. Meerut can expect light rains on 20th (upto 3 mms). Mumbai will be clear , with warm days at 32c. Kolkata will be cloudy on Wednesday. Thursday there can be light drizzles in some parts. Due to a weakening of the upper jet streams (temporarily), the other WD, F-4, will be approaching Pakistan and Northern India around the 23rd. Some respite from rains on 21st and 22nd in the North. F-4 expected to be strong with heavy rains, and much more can be expected in the Northern plains also. (Srinagar can get upto 75 mms on 23rd and 24th). Another Fairly strong WD can be expected around the 1st of March (M-1). More on Pakistan in "Vagaries Pakistan"